Beckoning with untouched powder stashes and framed in bluer-than-blue skies (it’s true — air at higher altitudes contains less water vapor, leading to brighter hues above), Colorado’s 41 state parks offer a refreshing, adventurous winter menu. On a solo endeavor or family excursion, for a day trip or extended stay, the following parks will keep you knee-deep in Colorado winter recreation. Set on 71,000 rugged acres, State Forest State Park in Walden is Colorado’s moose capital and is home to more than 600 of the massive creatures, making for some unbeatable nature photography. The November-to-April snowy season entices with marked, groomed cross-country skiing and snowshoeing trails, nearly 50 miles of snowmobiling paths and several squeal-worthy sledding hills. Yurt rentals are available for the ultimate in winter serenity. The park’s seven Siberian-inspired round tents provide secure shelter and come equipped with beds, a woodstove, lantern and cooking facilities. Dense pine forests, 36 miles of trails and close proximity to Denver — just 30 miles west in Golden — make Golden Gate Canyon State Park a prime spot for cross-country skiing, snowshoeing, ice fishing or just blissing out on 12,000 acres of Rocky Mountain beauty. Treasure the infinite view from Panorama Point Scenic Overlook, where more than 100 miles of the Continental Divide meet the Colorado sky. Ice fishing is popular at Slough and Kriley ponds, while skaters enjoy tranquil laps on the visitor center’s show ponds. Five cabins, two yurts, electric RV sites and a four-bedroom ranch home are available for cozy overnight stays. Solitude is paramount at this southwestern Colorado park during winter months. Only 14 miles from Ouray — dubbed the “Switzerland of America” — and set among the majestic San Juan Mountains, Ridgway State Park is a peaceful destination for winter hikes and fishing the five-mile-long reservoir. Yurt camping is available year-round by reservation, and the park boasts some of the most comfortable, ultra-modern setups around. Far from roughing it, these yurts sleep up to six with amenities that include thermostat-controlled heat, electricity, pinewood floors, a microwave and fridge. Ouray’s hot springs are perfect for soothing muscles after a day of exploring. Just 25 miles west of Colorado Springs, Mueller State Park is known for fantastic wildlife watching. Elk, black bear, hawks, mule deer and others thrive here. 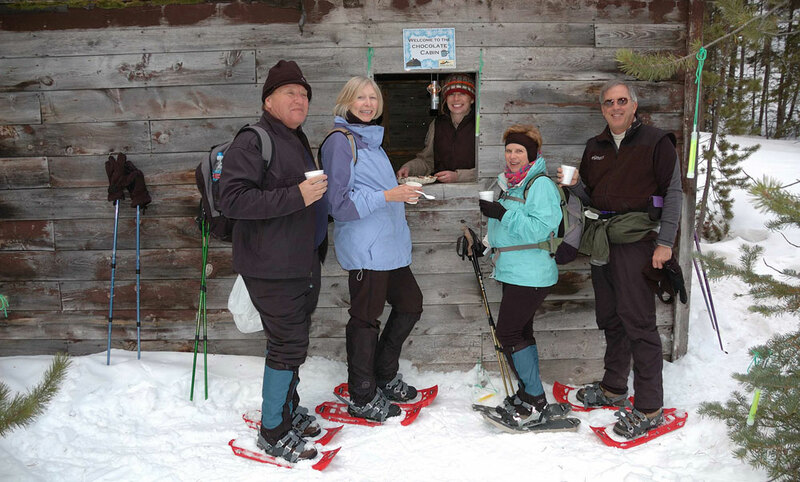 The park’s winter trail system offers snowshoers and cross-country skiers diverse routes that span from gradual one-mile loops to steeper seven-mile treks. A winter-sports enthusiast’s playground, sledding, tubing, skiing and snowboarding are easily accessible on three designated hills. Nestled in Colorado’s deep south, Navajo State Park near Pagosa Springs basks in balmy winter temps compared to its high-country counterparts. In fact, bald eagles and the occasional Canadian goose migrate here for the winter, typically arriving in December and staying through spring. Navajo Lake rarely freezes, and hiking along the 150 miles of shoreline is enjoyed year-round, along with boating and open-water fishing for the reservoir’s hefty population of large- and small-mouth bass, northern pike, trout, bluegill and catfish. For a full list of Colorado State Parks, their amenities and popular activities, visit www.cpw.state.co.us. Photo: State Forest State Park; courtesy of Colorado State Parks.